After years of wondering if Marvel Studios would do right by the Black Panther character, we finally have an answer and it’s a resounding “YES!” Marvel’s Black Panther is less an origin story and more of a “sins of fathers” movie as we see two ideologies being brought together for a clash that is as contemporary as the zeitgeist surrounding them. The movie actually starts in the 1990s as a younger T’Chaka (Atandwa Kani) meets his brother N’Jobu (Sterling K. Brown) to confront him regarding on some disturbing allegations. As the confrontation concludes, T’Chaka leaves threads untied which comes back to haunt his son and threatens the status of all of Wakanda. 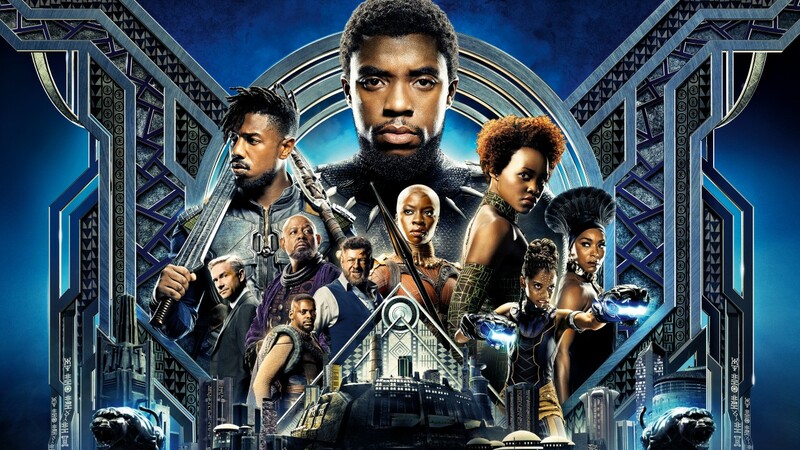 Once we are underway, the movie picks up as T’Challa (Chadwick Boseman) officially ascends the throne of Wakanda shortly after the events of Captain America: Civil War. T’Challa is faced with making a decision which would change his country’s isolationist standing and this is actually the foundation of the movie we are given. Ryan Coogler’s handling of the movie is reminiscent of Ta-nehisi Coates’ recent run of the comic in which we are able to see a fully rendered and fleshed out Wakanda. It was a nice touch as we are given a country which is thought to be dirt poor to outsiders without them ever fully knowing how really advanced that the country is. The facade is better rendered here than it’s ever been told in comic it was a relief to see how that issue was handled. The land is so rich in its melding of technology and nature that it’s a wonder that there is a fear of abuse by outsiders. Even small touches such as the alphabet and language rightfully plays such a greater role in creating a country that feels real and established and not something just created for one movie. More importantly are how the characters were portrayed in the movie. Chadwick Boseman’s Black Panther while wise and reserved at times seemed unsure about being king and a bit brash and arrogant. The portrayal was alright for this because it allows him to eventually to be made humble for things to come later on in the film when all seems lost. More important was how he interacted with the women leads in the film including Angela Bassett as Ramonda and Lupita Nyong’o’s Nakia. Most important to this movie however, was how the women acted with each other and on their own. One of my colleagues was concerned in how well the movie would do with the Bechdel Test being that much was made with the female leads being cast in the movie. The women were on equal footing with their male counterparts thus I would say that Black Panther did a good job with how all roles were treated. There were no damsels in distress; when things looked bleak, they weren’t looking for T’Challa or any other male figures to come save them and when there were ideas to be had, no matter how bad, they took chances. Which reminds me, even with Danai Gurira’s Okoye being given hard decisions to make, she chose duty over other options and it was poignant in the dialogue that she had with Nakia. Of course who could mention all of these great women without saying anything about Letitia Wright’s portrayal as Shuri. We are adopting this handshake! She was basically Q to her brother’s Bond and clearly could handle her own when she needed to. Shuri is part of the reason why Wakanda, like the Wu-Tang Clan, is nothing to f**k with. I am so ready to see her don the mantle one day as she had in the comics! What about Michael B. Jordan’s Killmonger? Initially, coming out of the viewing, I wasn’t exactly convinced that Jordan did that great of a job but after sleeping on it and thinking it over, out of some of Marvel’s recent villains, he will probably will be one of the most fleshed out, yet under rated villains they have ever had. Unlike others who just sought to commit evil and chaos for selfish gains, Killmonger actually is looking at a larger picture with bringing his people to the forefront. Although he has a sinister way of getting the results he intends, his motives are not self-centered. In hindsight, his role could be reflected in the attitude of many people in contemporary society now. Killmonger’s character is truly a reflection on who we are in today’s society and it’s almost shameful that when you reflect on this character, he still may not inspire the same awe and fear as say, Thanos. I could go on and on about the other characters such as Klaw and Ross (Smeagol and Bilbo!) and M’Baku but rest assured, all of the secondary characters are crucial to this movie. Ryan Coogler and his crew handled this movie with such love and care, including the hairstyles, colorful garb, rituals and so much more. The only small thing I wished I could have seen was an actualization of Bast and the connection to the kings but hey, maybe we will see something in the rumored four hour cut. I won’t hold my breath though. I will even be brutally honest in saying that considering the world’s climate today, I don’t think this movie would have gotten this kind of care ten years ago. It’s so refreshing seeing that characters who have always been considered B and C listers for so long get the overdue treatment that they deserve on film. So put your fears to rest; the hype is real, this movie entertains and in my estimation, this is the best movie Marvel Studios has put out since Iron Man.